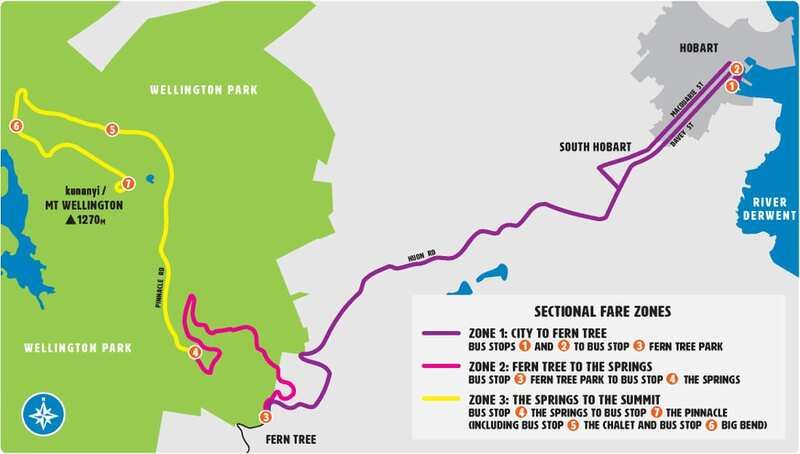 The kunanyi/Mt Wellington Explorer Bus route is split into 3 zones as illustrated on the map below. If you’d only like to travel part of the way, just ask your driver for a sectional fare when boarding the bus. When you travel within 1 zone, you’ll pay for 1 sectional fare. Example: 1 Adult travelling one-way from Bus Stop 1 Travel Centre to Bus Stop 3 Fern Tree Park, cost: $10. When you travel across 2 zones, you’ll pay for 2 sectional fares. Example: 1 Adult travelling one-way from Bus Stop 1 Travel Centre to Bus Stop 4 The Springs, cost: $20. When you travel across 3 zones, you’ll pay for 3 sectional fares. Example: 1 Adult travelling one-way from Bus Stop 1 Travel Centre to Bus Stop 5 The Chalet, cost: $30. Return trips incur an additional charge. Example: 1 Adult travelling from Bus Stop 4 The Springs to Bus Stop 7 The Pinnacle and return back to Bus Stop 4 The Springs, cost $20. Refer to our Map & Timetable page to find out the times at each bus stop. Note: Sectional fares can not be pre-booked and are subject to availability.